A ventilator is lifesaving medical equipment for critically ill patients who have difficulty in breathing, many times used as a last effort for patient survival. It’s also called a breathing machine or respirator requires making sure the person is getting enough oxygen and is getting rid of carbon dioxide, attached to a computer that is controlled by a respiratory therapist, or doctor. Due to the huge chunk of money involved and limited scale of the traditional ventilator; many patients, unfortunately, don’t get enough treatment and die prematurely in most developing countries. India faces a huge shortage of ventilator beds needed to support critically-ill patients who cannot breathe on their own. 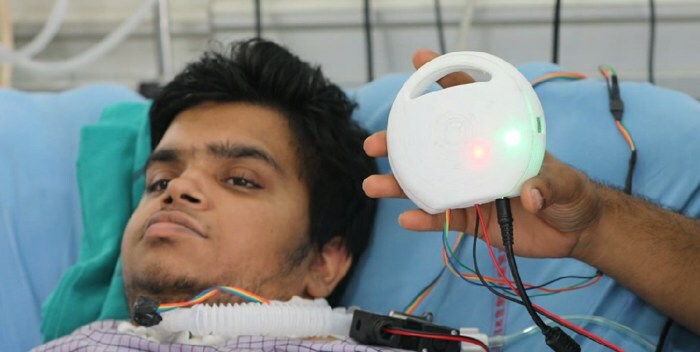 To address this issue, a 25-year old robotics engineer Prof Diwakar Vaish and a neurosurgeon Dr. Deepak Agrawal at the AIIMS have invented the world’s smallest and affordable ventilator which can easily fit in your pocket! If you have an android phone, you can control or run new ventilator yourself easily without much involvement of medical professional. It’s almost 450 times smaller than the conventional ventilators uses an Artificial Intelligence (AI) algorithm to control air supply to restore the normal breathing pattern of the patient. According to Dr. Deepak, the disposable ventilator runs on room air, and not oxygen, costs below INR 20,000 and has a maximum life of four weeks with no operating cost, reports Hindustan Times. The pocket ventilator is a great achievement in the field of medical science as it can save millions of people’s lives who are not able to breathe normally or whose lungs function insufficiently. How does this tiny ventilator work? New ventilator pushes the atmospheric air into the lungs of the patients who have difficulty in breathing. Unlike, traditional ventilator which pushes air at a fixed frequency that doesn’t necessarily match the patient’s breathing pattern and may result in low oxygen saturation, while invented ventilator synchronizes the air to achieve the normal breathing pattern. Presently this device is being used by many serious patients at AIIMS who are unable to breathe normally or on their own. In fact, more trial and approval from drug controller general of India require, making it accessible to many people who can’t afford traditional expensive ventilators. It can work on the normal power connection and comes with an additional battery backup for a couple of hours. As a safety feature, in an event of technical malfunction, this device will run on alternate or secondary mode and a message will be delivered to your android phone which will assist you how to correct the device. A robotics scientist Prof Diwakar is a serial inventor and his earlier technological inventions helped many people to gain normal life. In past, his invention ‘Manav’, a brain-controlled wheelchair & brain cloning to provide respite to the people suffering from paralysis. The mechanism of the wheelchair is designed in a way that it solely operates through the thought process of the person sitting on it.